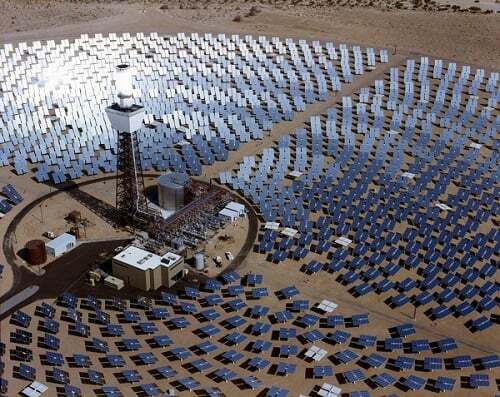 SolarReserve plans to build a $5 billion, 2,000-MW solar power project in Nevada, according to news reports. The Sandstone project would use molten salt concentrating solar power technology to generate power and provide energy storage capability. SolarReserve has not made a final decision, but is looking at sites in Nye County for the Sandstone Energy 10X project, which would sell power into the California market. There are about a dozen concentrating solar power (CSP) plants in the United States, but there is only one that combines the technology with molten salt to provide energy storage capability, SolarReserve’s 110 MW Crescent Dunes plant near Tonopah, Nevada, which went online in 2015. A CSP project aims mirrored reflectors, heliostats, at a “power tower” where the solar energy turns water into steam that drives a conventional steam generator. Using molten salt instead of water enables the heat to be retained and power to be generated into the evening. The technology solves one of the problems facing solar developers, but it is not cheap. The Crescent Dunes project sells power to NV Energy under a 25-year PPA for $0.135/kWh, about twice the cost of power from a gas-fired plant. But with its latest project, SolarReserve says the sheer size of its installation and its ability to sell power during the evening hours will make the plant competitive. "At this scale, solar thermal with storage will be lower cost than natural gas power plants, but just as reliable during peak periods," the company said in a fact sheet on the project. But at least one analyst was not so optimistic. Without significant state and federal studies beyond the investment tax credit, “there is virtually no way this project will be able to deliver electricity at a price that’s competitive today, much less five years from now,” Nathan Serota, an analyst for Bloomberg New Energy Finance told Bloomberg.